In 1879, Norwegian playwright Henrik Ibsen created a story ahead of its time in which a woman leaves her husband and children for an independent life. Writing today, Lucas Hnath has built a play around those characters, set 15 years after Nora left Torvald, that reflects both our time and theirs. Ibsen imagined a future, while Hnath looks backward to help us see what's changed and what hasn't. 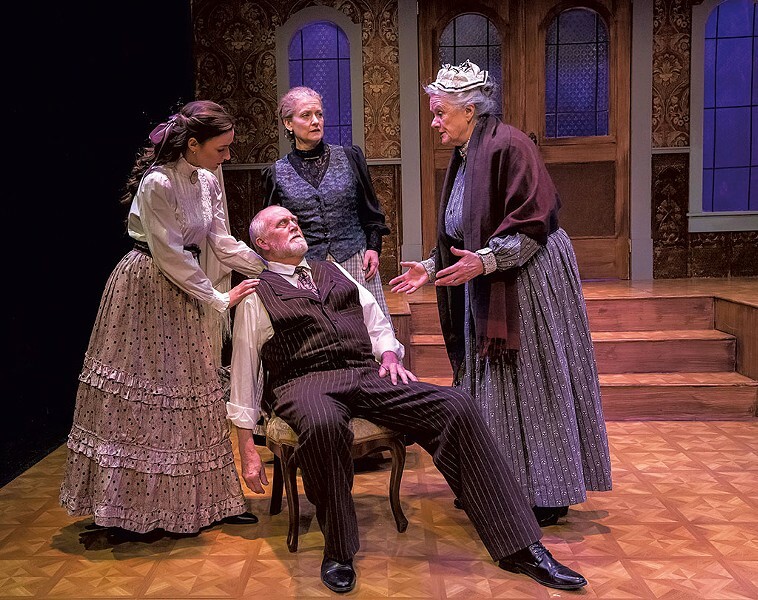 Vermont Stage's production of A Doll's House, Part 2 places ideas first and character second. Hnath's story sends Nora back home after a decade and a half on her own. Writing under a pseudonym, she's had success as a popular novelist who advocates that women abandon the constraints of marriage. Now she's come home to solve an urgent problem, as she's just learned that Torvald never obtained a divorce. The spine of the play is Nora's attempt to convince the nanny of her children, then her daughter and Torvald himself, that she should be legally free of marriage. Hnath uses her quandary to give all the characters a chance to advance competing arguments about gender equality, careers, child-rearing and companionship. The centerpiece is the question of marriage itself, and whether women are better off without it. Anne Marie, the nanny who raised Nora and later the children she left behind, refuses to be her ally in manipulating Torvald. She is too world-weary to scold Nora but too much a victim of class differences to think the world's biggest problem is marriage. The daughter, 19-year-old Emmy, is engaged and looking forward to being married, which she fondly describes as "being possessed." And Torvald admits to Nora that their marriage had problems but doesn't believe the solution was abandoning it without facing them. Hnath keeps the audience aware of both the 19th century and the present day through clever contrasts. The characters wear period clothing and face problems typical of their age, chief among them a married woman's loss of property rights. But they speak tart, modern language and wrestle with questions of inequality that could arise anywhere today. The contrast of old and new anchors the social questions in two eras at once. As we watch Nora seek a divorce so she can control her own money — a problem we now consider long solved — we also see the career-versus-child-rearing dilemma that hasn't changed a bit. If anything, 19th-century middle-class families had an edge: They could afford nannies. Viewers don't have to know the Ibsen play to appreciate Hnath's story, though familiarity with the original play would most likely increase one's investment in this one. Hnath provides sufficient exposition to give any viewer Nora's history. The Vermont Stage production is the first play in the company's new home at Main Street Landing Performing Arts Center's Black Box Theatre in Burlington. Scenic designer Jeff Modereger's tall set takes full advantage of the 17-foot ceiling, with the audience seated on three sides of a floor-level stage. Theatergoers who patronized Vermont Stage at its longtime previous quarters, FlynnSpace, will appreciate that no posts obstruct the view and that the lighting instruments are high enough not to shine in the audience's eyes. It's a pleasure to see the company's high production values supported by a suitable theater space. A raised platform holds the front door Nora slammed shut 15 years ago and now knocks on to start the play. Décor evokes the Victorian age in wallpaper and filigree, but the space is also fiercely modern, stripped down to two chairs and a settee. Costume designer Suzanne Kneller gives Nora a sharp traveling suit. Torvald's brown chalk-stripe suit, Anne Marie's perfect cap and apron and Emmy's sweet ingénue ruffles all make succinct statements about the characters. Jena Necrason, as Nora, gives the character unwavering conviction. Fifteen years of holding her ground have equipped her to withstand counterarguments. While certainty is arguably what makes Nora tick, it does not make great drama, because the play ends with Nora still firm in her resolve despite seeing the consequences of her actions. Hnath unreels a lot of abstract ideas, and Necrason tends to render these concepts intellectually, not as they affect Nora but as she champions or opposes them. Still, her passion for her own point of view is commanding. Emme Erdossy, as Anne Marie, doesn't wait to size up Nora after 15 years; she offers her opinions almost before Nora can reintroduce herself. Anne Marie has the age and gumption to speak her mind, and Erdossy plays plainspokenness for laughs, then hits deeper notes when explaining Anne Marie's decision to neglect her own child to raise Nora. As Torvald, Wayne Tetrick portrays the successful banker's grandeur and self-importance, but this dignity wobbles when he faces Nora again. Tetrick builds a tender portrait, straining to hold to the absolutes of moral rectitude as he honestly reassesses his lost marriage. Torvald struggles to relinquish his youthful love of the wife he had infantilized, as well as his sense of society's condemnation of her. Clarise Fearn, as Emmy, sometimes takes her own lines at face value. When she says she feels no rancor toward the mother who abandoned her, Fearn lets it stand as the truth, and perhaps it could be. Still, her decision to leave her abandonment unexplored makes her scene with Nora less a showdown than a meet and greet. Fearn excels at giving Emmy a youthful energy and a solid vision of happiness, glowing with simple joy when imagining her marriage. Director Margo Whitcomb mines the laughs in Anna Marie's candor but overlooks the script's other levels of humor. Instead, Whitcomb honors the text's big ideas by giving the conflicting points due gravity. The final effect on last Thursday's audience could be overheard as people continued the thought-provoking debate while making their way out of the theater. The original print version of this article was headlined "Marriage Revisited"